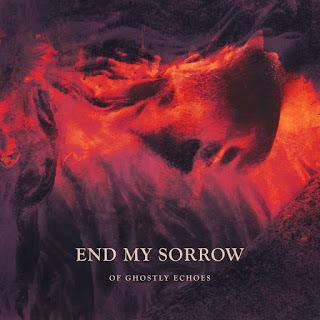 Melodic death metallers End My Sorrow hail over from Denmark on their debut album, called Of Ghostly Echoes, which was released on 25th of November. The album starts rather catchy with Wither Away, where growls meet the clear chant of female singer Anne-Mette Nielsen. This already is a prelude to the general tone of the album – what is striking there is that it’s not pure melodic death metal as we are used to, but rather a mix of different genres. Death, doom, symphonic, up-tempo, down-tempo… they have it all, but with a preponderance of melodic death metal tunes. Also the general tone of the album varies quite a bit throughout the songs, from catchy and energetic to melancholic and back. You’ll find doom influences for instance on Past Horizons, while Because of You almost has a commercial touch to it. So, in the end, you don’t really have a grasp on what you are in for from one song to another. Production-wise the Danes did well, just the mixing could have been improved at times, as the growls unfortunately sometimes just drift too far in the back. What’s left is a ride throughout a lot of genres and moods. While there is a bit of lack of a trademark sound in my opinion, the experimentation itself is quite nice to listen to. So if you love your metal varied, make sure to give this record a go! 7/10.